Lag? We Don’t Need No Stinking Lag! I have been noticing several comments on the web claiming that my tilt controller has too much lag to be worthwhile. Some people claim that they saw “seconds” of lag. I can understand how people can think that the controller has some lag associated with it. When watching someone play a game it is hard to judge whether the controller has lag or not because the games don’t usually have instantaneous response. If I am playing a racing game and am turning left then decide to turn right, it doesn’t happen instantaneously. It is built into the game controls. In this video I show you the Xbox 360 tilt controller in the Windows XP “Game Controllers” control panel. It shows you the X and Y positions in real time. For those that swear it is a fake and that they can “hear someone in the background clicking the analog sticks around”, I don’t know how to help you. Xbox 360 Tilt Controller – Finished! 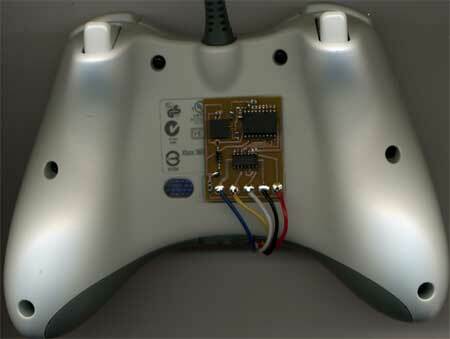 The Xbox 360 tilt controller is finished! I got rid of my breadboard mess, switched to mostly surface mount components and put everything onto a circuit board. It sure is easier to play games without wires hanging everywhere! I will be releasing a video of the finished version of this soon, but nothing has changed game play wise since the phase two video (below). You can find all of the details about this project in the phase two post also.